In U.S. schools, struggling readers need more help than they are now getting. Only about 36 percent of fourth graders were proficient in reading, according to the 2015 National Assessment of Educational Progress. The benchmark is important because research has demonstrated that children who are not reading proficient by the fourth grade lag through the remainder of their schooling. The Business Roundtable, a national organization of corporate chief executive officers, recently issued a report — “Why Reading Matters and What To Do About It” — urging policy changes to support efforts to improve reading proficiency among U.S. students in the K-3 grades. It urges states to adopt a range of policies with the aim of improving reading instruction in the early grades. A faculty member at Carolina’s School of Education — Lynne Vernon-Feagans — has led a research program that has developed and is evaluating a reading intervention that has been shown to be highly effective in helping teachers who work with struggling readers. Through the Targeted Reading Intervention, reading experts at the campus in Chapel Hill use webcam technology to watch teachers in distant schools work with struggling readers, coaching the teachers in the TRI technique. Carolina’s School of Education hosted a conversation about the Business Roundtable report and the Targeted Reading Intervention as part of its “EDTalks” series. The participants were Vernon-Feagans and Susan Gates, special advisor on education at SAS Institute, the analytics and data management software firm based in Cary, N.C. Gates had a leading role in developing the Business Roundtable report. Fouad Abd-El-Khalick, dean of Carolina’s School of Education, moderated the discussion. Following is an edited transcript of their conversation. Fouad Abd-El-Khalick, dean of Carolina’s School of Education, moderated an “EDTalks” discussion with Susan Gates, special advisor on education at SAS Institute, and Lynne Vernon-Feagans, William Friday Distinguished Professor at the School of Education. Fouad Abd-El-Khalick: Susan, can you please describe for us briefly what the Business Roundtable report found regarding the need for improvement in early literacy? Susan Gates: The Business Roundtable was concerned about the skills gap that is being experienced by companies across the United States and here in North Carolina as well, including at SAS where I work, and they realized that third grade reading proficiency is a milestone in children’s education continuum and that if you don’t achieve third grade reading proficiency, you have children who are four times more likely not to graduate from high school. You also have children who then are not going into post-secondary training and education and children who will struggle to develop soft skills like critical thinking and communications, which are vital in the business community today and will continue to be necessary as we look down the road. So the Business Roundtable put together a task force that was spearheaded by our CEO, Dr. Jim Goodnight, to better understand third grade reading proficiency, its impact on our economy, and then to determine how can we make sure more children are reading proficient. Here in North Carolina, 62 percent of fourth graders, based on the latest data, are not reading proficiently. The Business Roundtable came up with the six policy recommendations that states can put into place to strengthen and increase third grade reading proficiency. 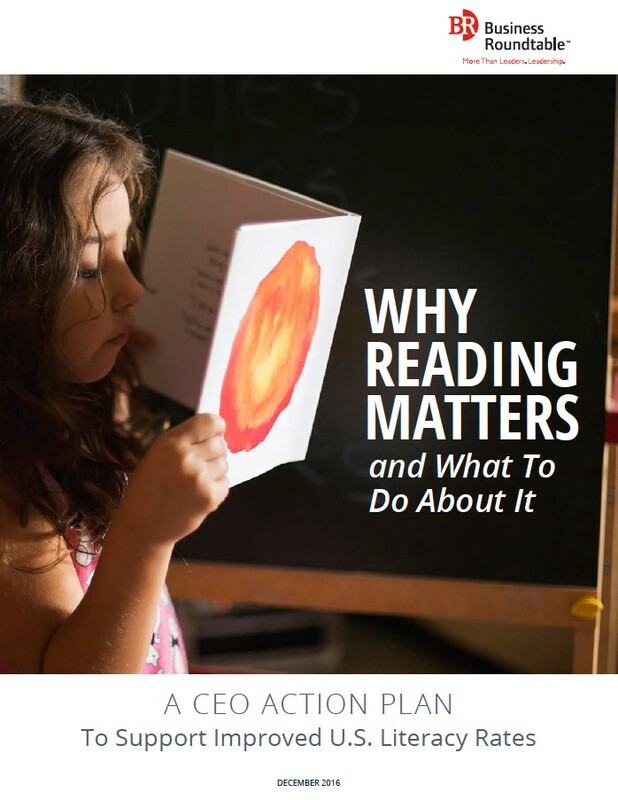 The Business Roundtable, an organization of CEOs from around the country, issued a report — “Why Reading Matters and What To Do About It” — calling for policies aimed at improving third grade reading proficiency. Fouad Abd-El-Khalick: Lynn, while you think about preservice teachers or practicing teachers in the classrooms, what does the research show us on how we can better prepare teachers to both teach reading, as well as help struggling readers? Lynne Vernon-Feagans: I want to say that the Business Roundtable report is really excellent and you have really looked at the research, which is not always the case on these reports. It’s definitely true that in the United States and in North Carolina, we’re not doing a good enough job in helping all of our children learn to read by third grade. Teaching reading is not easy and I think the general public sometimes underestimates the complexity of teaching children how to read, especially children who don’t get it right away. I’ve spent a long time trying to think about this. And we have developed some principles and an intervention that really works. Teachers often come out of undergraduate institutions, including ours, with skills to teach kids who will easily learn to read no matter what curriculum. But there are many children who really need direct instruction in reading, and teachers are not always prepared to do that. So I think we could do a better job at our universities in helping our undergraduates be better teachers of reading and there are a variety of ways to do that. A lot of it is just having more classes in methods but the other that we’ve learned is that teachers actually learn by doing. We have learned through research that teachers who go to workshops or even teachers in classrooms who just listen to lectures, that’s not how they learn. They learn by working with children and seeing what works. In our program, because we work a lot with low-wealth schools, where we have 70 to 80 percent of the children that are reading below grade level, we use webcam technology to Skype or FaceTime into the classroom and watch the teacher as she’s instructing reading and give her real-time feedback. Coaching we know really works. But it’s very expensive for schools. And especially in North Carolina, which isn’t the wealthiest state in the union, it was a challenge to think of how you can coach teachers. But through webcam technology, we Skype with teachers in Nebraska and Texas and New Mexico and we’ve shown that you can really make a difference in early reading with kids when classroom teachers are really prepared to teach reading. Fouad Abd-El-Khalick: You mentioned teachers who are in preservice training still at the university, and you mentioned teachers who are in the field, and you brought this notion of coaching or mentoring teachers as they are working in the classrooms. That’s really important because one-shot professional development workshops or a little bit of lecturing at teachers is not going to get us there. But at the same time, you talked about the expense and the difficulty of coaching teachers, especially in rural areas or teachers who are already out there in the classroom. Susan, I want to get your reaction to some of these comments regarding the need to work with teachers in preservice or in their classrooms. Susan Gates: I think you need to do both. What the Business Roundtable report discusses is trying to enhance the skill set while these are preservice students so that they truly develop the skills for teaching early reading and, frankly, teaching early math, which is related to third grade reading proficiency and early science and hone in on that. Another piece that is concerning to the Business Roundtable and to us here in North Carolina is making sure that principals understand early childhood development, making sure that they understand how literacy skills are developed so they can then manage, for lack of a better term, an elementary school where this work is going on. And there also needs to be perhaps looking at licensure and certification to encompass those early years. Here in North Carolina we have a birth-to-kindergarten license and then a kindergarten-to-fifth grade. The BRT report talks about that it really needs to span at least pre-K into those early elementary grades. It gives the principals flexibility but at the same time you can then include course work on early literacy instruction. Fouad Abd-El-Khalick: Lynne, I do want to go back to what I know is something you’ve worked with for years and years and years. It’s called the Targeted Reading Intervention. You talked about Skyping or using webcam technology to visit with teachers in their classrooms from a distance which enables you to work across a whole state in rural areas and other classrooms. Can you give us a better sense of what this reading teacher intervention looks like and what does your research show about its effectiveness? Lynne Vernon-Feagans: We have been working with teachers who are already out in the field but I agree with you that we have to do a better job at the preservice level and that’s including here at UNC and all of our universities around the country, not just in North Carolina. But I do think we have not used technology like we should have. For instance, at the preservice level what I would love in our School of Education is that we use these webcams to actually do some of the student teaching. So instead of having me go out and watch a student teacher, it’s much more efficient for me to use webcam technology. One of the advantages of being in North Carolina is we do progress monitoring in the classroom. And what our intervention does is it takes that progress monitoring information, which means that classroom teachers are assessing their children in reading over the course of the year. They have to do that three times for all children, but for the children that are struggling they do it much more often. But what teachers struggle with is: “What do I do with this information that will improve my instruction?” That’s what our program does. It links those assessments with information that the teacher can use to help individual struggling readers in their classroom. Our program does the big five, which is all of the aspects of reading that are important and the teacher works with an individual child for 15 minutes a day. A lot of people say: “But she doesn’t have time to do that, right?” But what we’re trying to do is to get the teacher to change the way she thinks about reading instruction. We have evidence from our research that the children in the classroom who have been targeted with our intervention actually make huge gains in reading. But every child in that classroom also gains compared to, in these randomized control trials, that we have now been doing for 12 years. We’re hoping that the kind of intervention that we’ve developed can make a difference for teachers. And I really think this is the way in which we can begin to start to help all of our children, but especially those struggling readers. The Targeted Reading Intervention is a research project developed by Lynne Vernon-Feagans, the William C. Friday Distinguished Professor of Early Childhood, Intervention and Literacy at UNC-Chapel Hill’s School of Education. TRI employs trained coaches with reading expertise using remote webcam technology to provide one-on-one, ongoing support for teachers working with struggling readers in rural, Tier 1 schools. Vernon-Feagans’s research, which has been supported by $15 million in grants from the National Science Foundation and other funders. It has been endorsed by The Annie E. Casey Foundation Blueprints for Healthy Youth Development, The Rand Corporation Promising Practices Network, and included in the “Best Evidence Encyclopedia.” It has been used in more than a half-dozen North Carolina counties and in several states. Fouad Abd-El-Khalick: So Targeted Reading Intervention could do two things. It could take university expertise into classrooms to help practicing teachers or in-service teachers, but also bringing the real classrooms to our and other institutions to bring the classrooms into the training of preservice teachers, to that’s a very very interesting model to move forward. But, both of you have talked about assessment. Susan, I want to go back to one of the recommendations of the Business Roundtable which is the need for better assessments. Can you please talk a little bit about what needs to be done in that area? Susan Gates: First you need to think about assessments broadly. It’s not just taking kids’ tests. You’re talking about very young children here. So, what needs to be assessed and understood? Here in North Carolina, we’re looking at the children from birth through age 8, which is the end of the third grade, and figuring out along that continuum what needs to be understood. There’s a fantastic initiative underway in North Carolina called the NC Pathways to Grade-Level Reading. That is an initiative of over 100 stakeholders, including many experts such as Lynne, to determine indicators that need to be identified, assessed, and the data captured around those, beginning with everything from low-birth-weight babies, then to looking at what skills do children have as they enter kindergarten. There’s a lot of work in North Carolina. In fact, North Carolina is spearheading it on kindergarten entry assessments so that kindergarten teachers, when that child enters their door, have better understanding of where the child is, not only in literacy but in all subjects. And then assessments, that Lynn can speak to much better than I, as the child progresses toward third grade. How is that child progressing toward literacy skills and other skills necessary to obtain by the end of third grade? Fouad Abd-El-Khalick: So the most important thing I hear you also saying, this is not about testing. Assessment is really just getting a diagnostic sense of where students are, how they are moving towards interventions. Lynne, can you tell us a little bit about how you use assessment and how can data, and formative assessments and diagnostic assessments help teachers as they work with struggling readers to lift their performance? The other area where children have problems is in reading comprehension which is related to their understanding of vocabulary, connected discourse, being able to summarize a story, those kinds of skills. Children can have deficits in both of these areas or one of them. What’s important is to make sure that the assessments in the schools have those. Right now I think we have pretty good assessments but just Susan, as you said, these are very young children, so assessing a child in kindergarten or even in Pre-K is very difficult. They’re not used to being tested. Fouad Abd-El-Khalick: What’s of high interest to us at the School of Education is trying to take these assessments and make use of big data, data analytics, so that the linkage between these assessments and teacher progress reports for the students and what to be done could be sort of facilitated through artificial intelligence and data mining that would really close the, at least the effort gap, and make these things more accessible to teachers as they work with struggling readers. Susan, you list a large number of policy recommendations so the trick question is, if you were to focus on two or three that you think are maybe precursors, the first stepping stones, you know, the first step in a thousand-mile journey, what would be the policy recommendations that you would like to highlight today. Susan Gates: There are three of them. There are six recommendations in the BRT report. No state has implemented all six of them and a group of CEOs that are being led by Dr. Goodnight from SAS are committed to making sure that North Carolina is the first to get all six of these recommendations in place. The first two really are to make sure we get a comprehensive, aligned system. I think that’s what has to be done before some of these other steps can be taken. So what the CEOs are urging Governor Cooper and the General Assembly to do is to create a comprehensive birth-to-eight system that is fully aligned with very clear accountability in it, so that it is implemented well and we can start to see that results are being achieved. That effort is already underway and so we are hopeful that when the recommendations are presented to the General Assembly at the end of the year, that they are vetted, modified if necessary and implemented. The second is closely related. Within that birth-to-eight system in North Carolina, the data is housed in different departments or agencies and it’s not talking to each other. If we’re going to have a comprehensive system, we need the data within that system talking to each other. And then the last one is that we have one of the highest quality PreK programs in our state. It’s a national model, it’s known as NC PreK. Right now there are 55 percent of eligible children are not able to get into the program. So the CEOs are requesting that NC PreK be opened up so that more eligible children can access the program. Fouad Abd-El-Khalick: I want to go back to this notion of assessment and accountability. Lynne, is there a tension between large sets of assessment data that are targeted towards helping struggling readers read and accountability data? Or do you see these two sets talking to each other as part of your research and part of your intervention? Lynne Vernon-Feagans: Well, they are definitely related. And of course, teachers now are somewhat evaluated based on the assessments in the classroom, because they need to show that their children are making progress and that’s the way they are accountable for the learning in the classroom. I think a lot of what we might need from places like SAS is a way for teachers and principals to interpret the data that they get. They get this massive amount of data that now is available through the state, through all kinds of things, on the children in their schools. But they’re not sure how to use that information to make a difference for individual children. If businesses and schools work together to try and think about how we can make these accessible and understandable to the teachers and the principals that would be really valuable. Director of Communications at Carolina’s School of Education.